If you carry any rechargeable electronic gadgets into the backcountry, they won’t do you any good if they run out of batteries. Now you can choose from two different cook systems that generate electricity from the heat of your camp stove and can recharge any USB-compatible device. 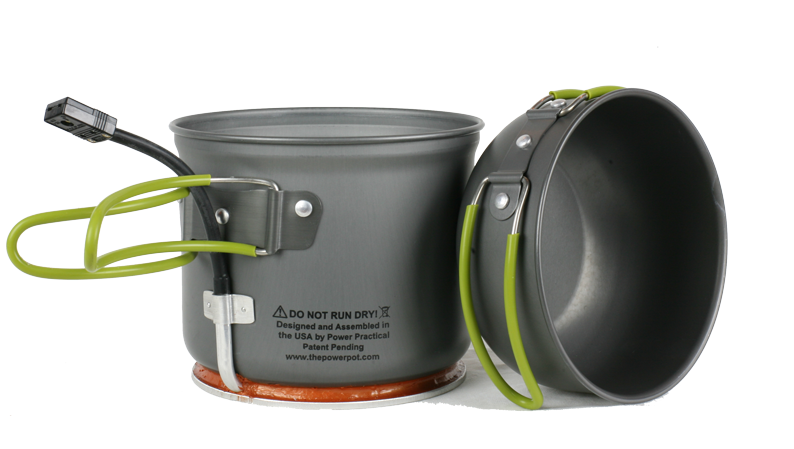 The PowerPot is an anodized aluminum cookpot and lid that features an electricity-generating component. A 3-foot-long heat-resistant cord emerges from the side of the pot and features a standard USB outlet at the end for plugging in your electronic device of choice. Its 5-watt generating capacity is sufficient to charge all USB-powered devices, including smart phones, UV water purifiers, LED lights and lanterns, and headlamps. The PowerPot V ($149) is the company’s lightweight offering and features a 1.4-liter pot as well as a lid that doubles as a small frying pan (18.2 ounces for the whole package, or 12 ounces for just the pot). There’s also the PowerPot X ($249), a larger, heavier 40-ounce version for home use that generates 10 watts of power. Both come with a five-LED USB light to illuminate your cooking world. The PowerPot V system, including the cord, is rated to 600 degrees Fahrenheit, making it safe to use on even the hottest campfires. The company recommends that only water be used in the PowerPot to provide optimal power output. Learn more about the technology behind the PowerPot. Annoyingly, the company does not indicate how long it would take to charge different types of mobile devices—a crucial piece of information, especially on longer backpacking trips when you need to carefully ration your stove fuel. I profiled the Biolite CampStove back in February before it had become available for purchase. 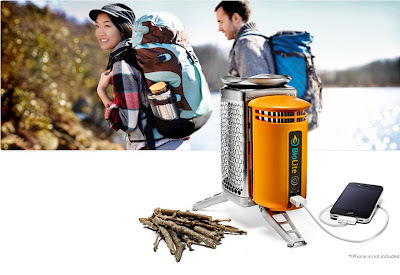 Unlike the PowerPot, the Biolite CampStove ($129) is a self-contained cook system that burns organic material (wood, twigs, etc.) for heat and generates electricity from a small unit attached to the side. It generates up to 4 watts of power. According to the company’s web site, charging an iPhone 4S for 20 minutes provides 60 minutes of talk time (a useful proxy for the PowerPot, which has a slightly higher power output). The Biolite is now available for purchase and seems to be generating some quality reviews, including this one from Outside Magazine and another from hiking guru Andrew Skurka.